Jakarta is the capital city of Indonesia. It is a really big city. You will find a lot of skyscrapers, popular building, even the best airport there. This is an urban city where many people live and move there for earning money. The most densely populated city in Indonesia is Jakarta. Imagine that almost 30% of Indonesian live and stay there. Traffic jam and criminal is everywhere. However, Jakarta means a lot for some of people. It is not about the beauty of this city, but the culinary, where some people just want to stay a little bit longer there. Because of its culinary, they can find so many various kinds of food there. However, the traditional one is the best in Jakarta. Here are the list of what to eat in Jakarta. Kerak Telor (Egg crust) is a native food of Jakarta (Betawi), with white sticky rice ingredients, chicken eggs, ebi (marinated dried shrimp) which is dried roasted plus fried shallots, then given mashed spices in the form of roasted coconut, red chili, kencur , ginger, pepper granules, salt and sugar. The main ingredient of this food is rice mixed with eggs and various other spices. There are 2 types of eggs used, namely chicken eggs or duck eggs. The way to cook this snack is to bake it, on top of the cauldron below which you wait for charcoal. After the rice is cooked, then it is reversed, with the rice technique facing the coals of fire, not behind the cauldron. Once cooked, this egg crust will be sprinkled with fried onions and also serundeng. This is one of the typical Betawi dishes that are always available at weddings or other traditional Betawi events. There is a special meaning from this crocodile bread, making this one food always present at a typical Betawi event. 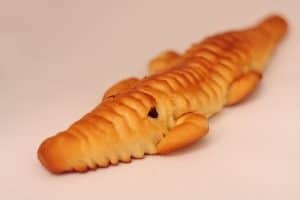 At present, crocodile bread has undergone various kinds of innovations, where bread that used to have no taste, now has fillings in various kinds of jam. Crocodiles have become animals that are considered sacred by the Betawi people since the days of ancestors. According to JJ Rizal, a Betawi-born historian, a crocodile has only one partner in his life. For this belief, the Betawi people use crocodiles as a symbol of loyalty. In the marriage it is hoped that the couple will be loyal to each other. Basically, this Betawi soto is not much different from other soto in Indonesia. Basically, the contents of this soup use various beef innards. Even the eyes, torpedoes, and also the heart, are also mixed into the soto. The sauce of this soto is a mixture of coconut milk and milk, which is added with various other spices. 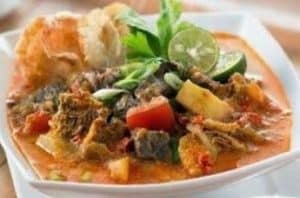 This is what makes Soto Betawi so unique. Therefore, Soto Betawi is always a menu that must be tasted when visiting Jakarta. Are you one of those who will also try it? 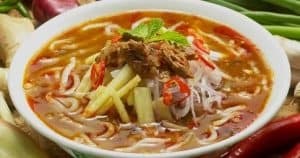 If you see the picture, the appearance of Laksa Betawi is similar to Soto Betawi, only has different contents. The contents of this Betawi Laksa are vermicelli, basil leaves, eggs, cakes, and also chives. The sauce uses yellow sauce. So that it tastes savory and sweet. This is one type of culinary that is also easy to find. Usually the traders are Betawi Chinese. If you are in Jakarta, it never hurts to try this menu. The warm and savory taste is ready to accompany when the rain falls on the city of Jakarta. Nasi Ullam Betawi is usually equipped with beef jerky, crackers, and omelet. Ulam rice is a rice dish mixed with various herbs and spices, especially Pegagan leaves (Centella asiatica) or sometimes replaced with basil leaves, vegetables, and various spices, and accompanied by several kinds of side dishes. This dish comes from the treasures of Malay dishes, and there are many recipes and variations found both in Indonesia and Malaysia. Nasi ulam is actually rice mixed with various herbs and spices, such as gotu kola leaves, basil leaves, etc. Not only that, this rice will also be mixed with various side dishes. This unique and delicious culinary one is not hard to come by. It is because this snack is widely sold in various typical Jakarta restaurants. Gado-gado is actually a Javanese food in the form of vegetables that are boiled and mixed into one. However, you can also find a lot of this food in Jakarta. This food has a special flavor of peanuts which is pureed. Do not miss the egg slices and a sprinkling of fried onions on top. This unique and delicious presentation will be more complete if added with fried chips or crackers. 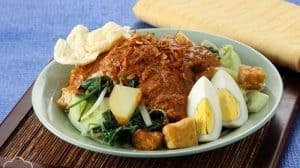 Gado-gado which is eaten almost like a salad is indeed quite simple. The international cooking competition at Napoli in 2010, proved proof of gado-gado not just any food. In this event, gado-gado became the first winner in the aesthetic presentation display category. For that reason, gado-gado became one of the typical Indonesian foods that go international. 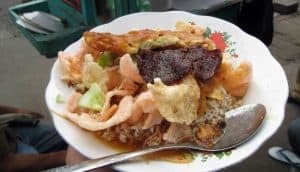 Other foods that are also quite polluted in Jakarta are nasi uduk. This one food, you often encounter as one of the breakfast menu. When in Jakarta, you will easily find this food. The main ingredient of this food is white rice, which is cooked using coconut milk and given various kinds of spices, such as cinnamon, ginger, nutmeg, pepper, etc. Because of the rice taste, this menu becomes more delicious. As a complement, it is usually also added fried tofu, omelet, and fried chips. 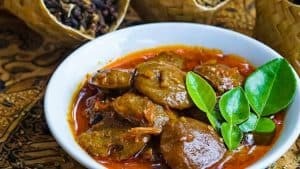 This is jengkol stew or people in Jakarta usually call it Semur jengkol. Jengkol is an endemic vegetable of Indonesia. It is famous for its smell. For some people, the jengkol smell can make him dislike, but for jengkol fans, this dish is very popular. This dish is cooked with jengkol which has a bitter taste, but after being cooked using various herbs and spices, jengkol is delicious to eat. Jengkol Semur is usually served with white rice or warm nasi uduk. Don’t forget to try this one Betawi dish if you visit Jakarta. 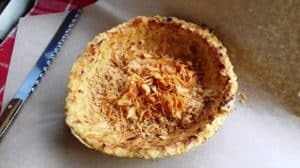 Cucur cake is one of the traditional Betawi cakes that are often and easily found in traditional markets and in cake shops. These cakes can also be found in places such as wedding ceremonies, baby haircuts and more. This cucur cake tastes sweet with a soft texture in the middle, and crispy at the edges. This rice-based cake and brown sugar are cooked in a fried manner. This is one of the typical Betawi foods that you must try. Another Betawi snack is Ranggi cake or Jakartan usually call it kue ranggi. This one cake is made from rice flour or it can also be made from starch, and also grated coconut. The way to make it is to combine the two ingredients, then roast over low heat using a mold. The molds used are semicircular, like baking pan. Once cooked, the cake will be sprinkled with melted molten sugar, which has previously been mixed with starch, to make it thicker. 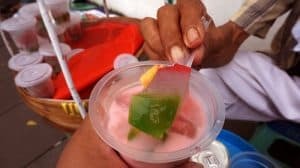 This Betawi culinary is a typical Betawi drink. Pletok beer is not ordinary beer. This beer has health benefits and does not make you drunk because it does not contain alcohol. This beer is made with basic ingredients of Indonesian spices with a mixture of ginger, pandan leaves fragrant and lemongrass. To attract buyers, these beers are usually mixed with extra wood, which will make the color of the beer red when added with hot water. 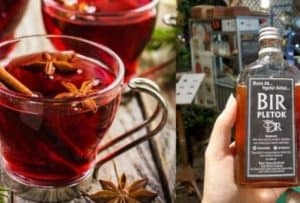 Are you interested to try? The cake dough inside the large shawl is made like gelatin with attractive colors. These beautiful colors are like a shawl. Therefore it is called ‘selendang (shawl) mayang’. Cake dough that has been cut into pieces is served along with a spray of Javanese sugar syrup, coconut milk sauce, and pieces of ice cubes. When you are in Jakarta, you will find many traveling merchants who sell these sweet foods. This food is best to drink when the weather in Jakarta is hot. 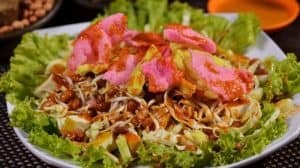 Asinan Betawi is generally a mixture of mustard, cabbage, bean sprouts, white tofu and lettuce sprinkled with fried peanuts. All of that was then doused with peanut sauce and mixed with vinegar and chili with large yellow noodles crackers. Besides being tasty and fresh, this Betawi food is also considered healthy because it uses a lot of vegetables. Don’t forget to make this menu on your to eat list. 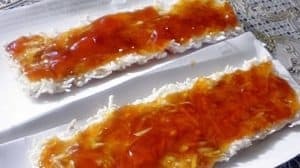 Kue Rangi: This betawi cake made of from a mixture of grated coconut and sago flour is served with brown sugar sauce which becomes thick with sago mixture. Kue Pancong: Generally, this typical Betawi snack is half circle in shape, made from coconut milk, large flour, coconut, and salt. This cake is usually eaten in the afternoon beside warm tea. Kue ape: This traditional Betawi cake is similar to this pandanus cucur cake called ape cake. This cake has a crisp and crunchy texture on the edges made of pandanus so it’s green. Kembang goyang: The process of making is shaking it until the mixture is released from the mold. Kembang goyang cake is made from the basic ingredients of glutinous flour which now has many other flavors. Kue talam: Talam is one type of traditional Betawi snack that is easily found anywhere in Indonesia. This cake is made with flour ingredients such as rice flour, tapioca flour, flour or sago flour. Gabus pucung: This is made from cork fish and deep black soup from pucung with a mixture of kluwak. Pucung sauce is similar to rawon sauce but has a different texture. This Betawi food is served with cork fish fried and doused with pucung sauce. Roti gambang: Gambang bread is traditional Betawi bread made from flour and brown sugar. This brown sugar causes this bread to have a brown color without the need for additional synthetic dyes. Those are the list of traditional food in Jakarta you have to taste. Although you can find any kind of food in Jakarta, you should not to forget to taste the traditional one. You might be depressed with the traffic jam there, but trust me the foods are so delicious. 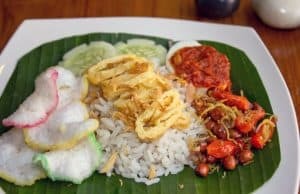 Best Restaurants in Ubud Indonesia – The Top 15!